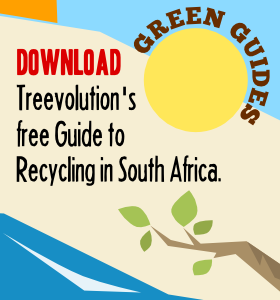 Recycling for your average suburban household in South Africa is a bit of a schlep: the infrastructure for collecting recyclable material isn’t really in place – yet. Households generally have to separate their rubbish and take the recyclables to a municipal drop-off centre or a buy-back centre because there’s not much in the way of kerbside collection. Many people just can’t be bothered. But, there are also many people out there who would recycle if they knew how to. This guide aims to help you get started. Informal recyclers recover much of this material from dustbins and landfill sites. This is not ideal, firstly from the point of view of the health and safety of the recyclers. But also because the recyclable material is contaminated with other waste. First prize would be if households sorted their waste, so that “uncontaminated” recyclable material could be collected. Light bulbs – ordinary and energy-saving compact fluorescent lights (CFLs) – and fluorescent tubes. NB CFLs and fluorescent tubes should not be thrown away with ordinary rubbish. They contain mercury, a toxin that can leach into the soil and groundwater if not disposed of properly. Take your old CFLs to the drop-off points at Pick n Pay and Woolworths stores where they will be disposed of safely. If you don’t have this option, place your old CFLs in a sealed plastic bag before you throw them in the bin. Alternatively you can contact Ewasa (the E-Waste Association of SA) for other contacts. Disposable batteries are not recycled – this is apparently because the material recovery rate is too small to make recycling economically viable. But they should not be thrown away with ordinary household waste either, because they contain toxic chemicals that can leach into the soil and groundwater. Rechargeable batteries, on the other hand, are recyclable. Add to this the fact that they last a lot longer than ordinary batteries and you have a compelling argument to buy rechargeables from now on.